* Angling Trust Riverfest, River Swale, Scruton, North Yorks. Sat, 59. Matt Maginnis (MAP) 31-3-0, 10 chub, waggler and maggot, peg 3; Steve Webster (Mirfield Willy Worms) 22-7-0; Keith Mottram (Aireborough) 21-12-0; Steve Beckwith (Leeds Angling Centre) 21-6-0; Dave Atha (Leeds) 21-0-0; Jamie Holder (Ripon) 18-12-0. * Bank End, Finningley, S. Yorks. Sun, 33. Steve Donoghue (Daiwa Dons) 138-11-0, carp on poled pellet, peg 9; Graham Housley (Bank End) 136-3-0; Steve Rylance (Bank End) 122-9-0; Reg Fearn (Daiwa Dons) 109-2-0; Danny Myers (Garbolino Elton) 104-13-0; Len Squire (R & R Sports) 103-7-0. * Daiwa Hallcroft, Retford, Notts. Sun, 46, Moat and Bridge outer lakes. Mark Stainsby (Barnsley Bait Co) 91-8-0, carp, corn and meat in margins, peg 36 Bridge outer; Craig Owen (Parkgate Angling) 86-15-0; Phil Wright (Leegem) 82-6-0; Kev Baxter (Mosborough) 77-15-0; John Powell (Parkgate Angling) 77-8-0. * Happy League Practice, New Junction Canal, Sykehouse, South Yorks. Sun, 62. Craig Ellis (Tri-Cast Calder) 4 Kg 780 gr, roach on poled hemp and squatt, peg 417; John Deakin (Daiwa Dons) 3.750; Mark Bawden (Daiwa Dons) 3.660; Daz Hall (Ossett) and Steve Williamson (Hull DAA) both 3.650; Brian Hawkins (Sensas) 2.980. * Leeds DASA, River Wharfe, Ulleskelf, North Yorkshire. Sun, 38. Mick Raper (Leeds) 26-12-0, five barbel on feeder and caster from the rapids; Keith Lancaster (Leeds) 20-6-0; Lee Furness (Leeds) 16-6-0; Stuart Thompson (Leeds) 11-12-0. * Mirfield, River Calder, Altofts, West Yorks,.Sun, 40. Andy Bradley (Mirfield Willy Worms) 10-8-0, 10 skimmers and four perch, feedered worm, peg 13; Bob Foster (Tackle 2U) 11-8-0; Tony Earnshaw (Mirfield Willy Worms) 10-5-0; Dave Miles (Leeds) 10-3-0; Paul Clarke (Mirfield Willy Worms) 8-8-0. * Oaks, Sessay, North Yorks. Sat, 34, Cedar Lake. Chris Kendall (Middy) 91-2-0, F1s on pellet at 3m, peg 73; Phil Sellars (Woodlands Tackle) 90-15-0; Dean Smith (Maitrix Bait-Tech) 83-0-0. Sun, 45, Ash, Beech and Sycamore. Dean Smith (Maitrix Bait-Tech) 142-4-0, carp to 4 lb, poled pellet, Beech 2; Steve Richards (Woodlands Tackle) 140-3-0; Chris Kendall (Middy) 130-10-0; Greg Norris (Bag’em Matchbaits) 129-10-0. * Ripon, River Ure, Ripon, North Yorks. Sun, 32. Steve Beckwith (Leeds Angling Centre) 40-6-0, 12 chub, stick float, above North Bridge; Pete Miller (Aireborough) 27-11-0; John Taylor (Ripon) 12-14-0; Paul Wood (Aireborough) 10-6-0. * Sykehouse Fishery, Doncaster, S. Yorks. Sun, 30, Twin Isles lake. Jamie Knott (Stainforth Angling) 80-2-0, carp, bomb and bread, peg 28; Andy Kelk (Leeds) 61-4-0; Arthur Bullcroft (Mexborough) 49-7-0. * Thornaby, River Tees, Croft to Hurworth, County Durham. Sun, 51. Jim Johnson (Shilden) 18-6-0, five chub plus dace, stick and caster, peg 51 above Skerne mouth; Shane Atkin (Thornaby) 17-14-0; Ron Hopkins (Thornaby) 16-0-0; Billy Leonard (Thornaby) 15-10-0; Ken Ovenden (Thornaby) 11-14-0. * Yarm, River Tees, Yarm, Cleveland. Sun, 45. Mal Dunlop (Mosella Quaker) 13-14-0, eight skimmers, poled worm, peg 182 at golf course; Graham Jones (Maver Newman Scotts) 13-1-0; Dave Walker (Daiwa Cleveland Angling) 12-6-0; Steve Wilson (Yarm) 11-14-0; Russ Hodgson (Shotton) 11-5-0. Daiwa Hallcroft, Retford, Notts. Mon, 21, vets, Bridge Lake. Andy Sellars (R & R Sports) 90-8-0, carp to 10 lb, waggler and pole shallow with meat and pellet, peg 43 outer; Dave Whiting (Buttonhole AC) 73-6-0; Mick Cooke (Retford) 61-7-0; Dave Sewell (James Maude AC) 61-5-0; Paul Schoof (Hallcroft) 57-13-0. Tue pm, 26. Moat Outer. Alan Tait (Packet Inn) 98-8-0, carp, shallow pole with meat and pellet, peg 61; Gavin Leversidge (Marukyu/Halkon Hunt) 84-2-0; Dave Whiting (Buttonhole AC) 62-2-0; Jamie Masson (Colmic/Marukyu) 56-9-0; Mick Hall (MAP Tuxford) 49-12-0. Thurs, 37, vets, Moat lake. Alan Crouch (Garbolino) 96-7-0, carp to 9 lb, poled meat and pellet shallow, peg 8 outer; Lee Hewison (Leegem) 81-13-0; Dave Whiting (Buttonhole AC) 61-12-0; Paul Schoof (Hallcroft) 59-12-0; Ray Brooks (Sheffield) 57-14-0. Fri pm, 27. Moat. Dave Whiting (Buttonhole AC) 154-13-0, carp on poled worm in the margins, peg 32 island; Mick Hall (MAP Tuxford) 123-15-0; Neil Hirst (Ackworth) 85-3-0; Pete Miles (Rotherham) 73-6-0; Steve Robbins (Leegem) 67-15-0. Sat, 16, Bridge island and Croft. Ken Talbot (Doncaster) 84-6-0, carp and silvers, poled pellet and paste, peg 25 Croft; Dave Dare (Marukyu) 77-15-0; Gary Mumby (Team Frenzee) 76-9-0; Pete Bagshaw (Team Frenzee) 75-0-0. Ferryboat Farm, Conisborough, S. Yorks. Thurs, 12. Gary Walsh (Ferryboat) 28-8-0, carp on pellet feeder; Tony Brown (Ferryboat) 22-8-0; Paul Hunton (Rotherham) 21-0-0. Sun, 15. Paul Dolton (Rotherham) 29-0-0, carp on pellet feeder; Paul Hunton (Rotherham) 25-8-0; Tony Brown and Steve Billups (both Ferryboat) both 24-0-0. Kiveton Hall, Sheffield, S. Yorks. Sun, 15. Mick Todd (Kiveton) 112-0-0, carp on poled pellet, peg 71; Dave Stone (Kiveton) 65-8-0; Paul Burt (Kiveton) 60-14-0; Lee Hendley (Kiveton) 43-8-0. Oaks, Sessay, N. Yorks. Tues, 16, Maple. 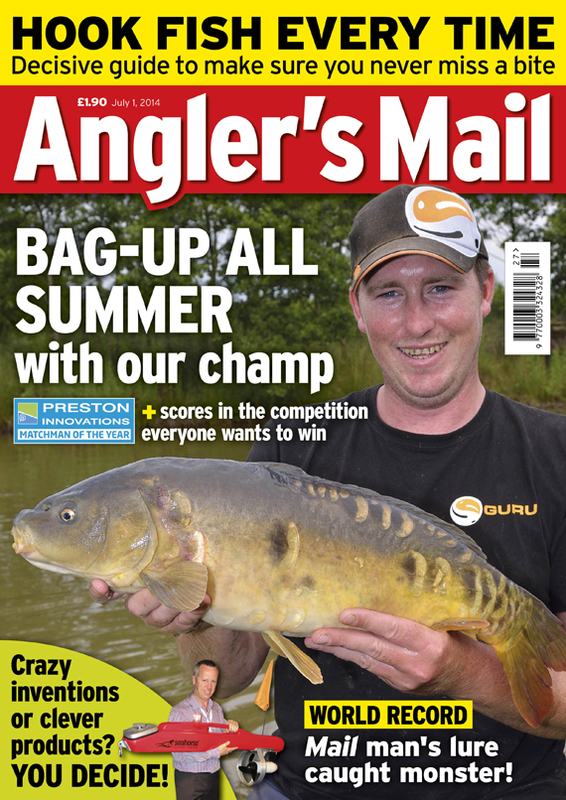 Chris Kendall (Middy) 100-4-0, carp, paste, peg 45; Andy Barker (Oaks) 96-12-0; Chris Hall (Oaks) 95-5-0. Wed, 17, Ash, Beech and Sycamore. Dean Smith (Maitrix Bait-Tech) 275-8-0, carp to 4 lb, pellet, Beech pegt 15; Rob Minikin (Sonubaits) 241-6-0; Chris Hall (Oaks) 230-13-0. Thurs, 14, Cedar. Chris Hall (Oaks) 134-9-0, carp to 5 lb, pellet up in‘t air; Chris Kendall (Middy) 130-10-0. Oaktree Leisure, Huby, North Yorks. Sun, 16, Pond Four. Steve Hodson (RSPS) 101-0-0, carp to 6 lb, meat and corn at 10m, peg 52; Brian Pallister (Black Horse) 66-0-0; Mick Babb (Oaktree Leisure) 61-8-0. Phoenix and Parkgate, Ravenfield Ponds, Rotherham. Tues eve, 12. Mick Barry 27-8-0, bream and tench, poled caster, peg 69; Mark Jackson 26-12-0; Derek Jackson 26-8-0; Harry Booth 14-8-0 (all Phoenix and Parkgate). Rotherham UAF, River Don, Sprotborough, S. Yorks. Sun, 10. Joe Murray (Maltby Mafia) 13-10-0, roach on stick float and maggot, peg 41 Nature Reserve; Paul Bacon (Paul’s Tackle) 9-8-0. Sykehouse, Match Lake, S. Yorks. Wed, 22. Gavin Millward (Dampper) 157-14-0, carp on pellet waggler shallow, peg 20; Brian Werritt (Stainforth Angling) 139-2-0; Mick Glaister (Stainforth Angling) 85-6-0. Thurs pm, 18. Paul Yates (Drennan) 166-3-0, carp on poled meat, peg 20; Mark Price (Stainforth Angling) 135-12-0; B. Haigh (Rawtenstall) 76-2-0. Woodhouse Grange, Doncaster, S. Yorks. Wed, 14, Kingfisher Lake. Chris Bradley (Fox and Hounds) 158-15-0, carp on poled pellet, peg 11; Bernie Larder (Woodhouse Grange) 93-10-0; Graham Martin (Sheffield) 79-13-0. Wed pm, 18, Heron. Sean O’Mally (Medusa Baits) 74-7-0, carp on poled pellet, peg 43; Ian Taylor (Medusa Feeders) 64-10-0; Lee Bird (Woodhouse Grange) 55-0-0. Thurs, 12, Heron. Martin Vairy (Woodhouse Grange) 97-2-0, carp on poled pellet, peg 8; Dale Vairy (Woodhouse Grange) 65-10-0; Keith Dodds (Woodhouse Grange) 50-7-0. Sat, 20, Cobble. Steve Gertsmar (Medusa Baits) 54-14-0, carp on poled pellet, peg 46; Pete Gosney (Barnburgh) 44-1-0; Bernie Larder (Woodhouse Grange) 41-14-0. Sun, 22, Cobble. Bernie Larder (Woodhouse Grange) 56-6-0, carp on poled pellet, peg 46; Vic Molyneux (Woodhouse Grange) 48-2-0; Ian Taylor (Medusa Feeders) 36-6-0.